In less than 2 hours, I believe we will witness an epic 90+ minutes. Arsenal MUST win in order to send a message to all doubters across England and Europe. This will be a symbolic passing of the baton from one Red club to the other. This will also be the revival of true English football. The money and the glam that clubs like Man City and Chelsea have bought have dampened the real essence of English Football. 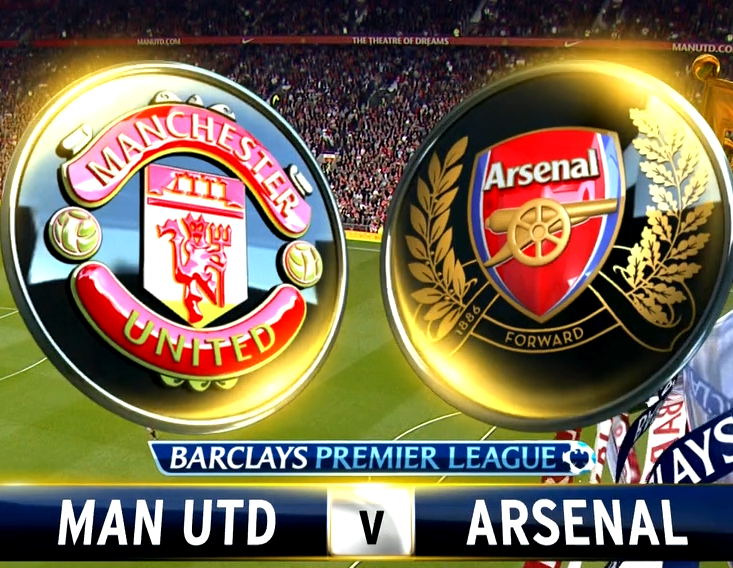 Tonight, Arsenal and Man United will bring back the glory days. This match win, lose or draw will leave no doubt in anyone’s mind- Arsenal and Manchester United alongside Liverpool are the Greatest English Footballing Giants. The intensity of this game will no doubt be unmatched. Money can’t buy you spirit. This will once again be the worldwide spectacle it used to be a decade ago. We will witness a WAR!!! Straight off the bat, both teams will press and push forward. Expect 11 v 11 battles, expect 1 v 1 battles, expect cards of the darker shade, expect Blood. The high mutual respect between the clubs is the reason why this match is so important to these two clubs. Everyone has to be on top of their game. Let us hope the officials don’t disappoint. Here is what I think should be our iron clad blueprint to a full 3 points at the Theatre of Dreams. Sagna and Gibbs must be cautious against the likes of Valencia and Nani. But also provide width to our central diamond. Koscielny can stay tucked in and be solid in clearing out. 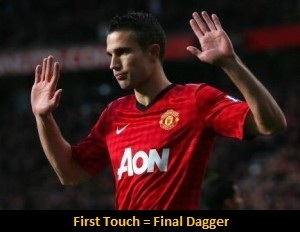 No freekicks must be given to the left foot of RvP. Per must act as a sweeper. We shouldn’t play a high line like we did against Dortmund else United will punish. Flamini and Arteta must cover our posts during defensive corners. Speed of our counter-attack is very important. Arteta must hold, Flamini must press. Cazorla and Ramsey should be willing to take shots from outside the box. De Gea needs to be tested. Ozil must be given a free and more central role. Tracking back and defending as a team is important none more so against the wingers of United. 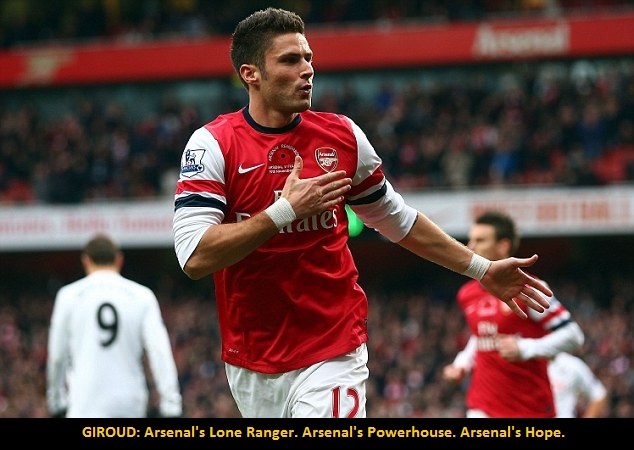 Solitary but solid, Giroud will have an interesting head to head with Nemanja Vidic. Giroud must not be wasteful. Far and few chances are given in a match of this magnitude. Win all headers. Don’t hold up play … There is no time. Team Play: An imposing last line of defence, a well marshalled back line, a solid double pivot and a destructive quintet together are sufficient to Fight for Pride, Fight for Glory, Fight for the name in front of our jerseys. This is more than 3 points, this has to be more than a great win, this is for LEGACY. Score Prediction: 2-0 or 3-1 to the Arsenal. This is my gut instinct. I threw rationale and logic out the window. I expect this match to blow my mind away. As the lyric in ‘Remember the Name’ goes … “Eight years in the making, patiently waiting”. It’s about time … We raise hell in the Devils’ own backyard tonight. OOH TO … OOH TO BE … OOH TO BE A GOONER … C’MON ARSENAL!!! It’s almost been a year since I stopped my blog because of the lack of fight and ambition from the club I’ve grown up watching since high school. Finally I jump from my seat in joy and not yell at the TV like I have done since we moved to the Emirates Stadium. This season we have grit and experience and a LOT more quality (at least in the first 11). Arsenal now sits atop the league but for how long? The real season begins now…. A barrage of heavyweight clashes starts with a home game with Liverpool followed by Man United away. A Clash with Dortmund on their home turf is also in the cards. November is the season defining month for us. It would tell us where we would stand come January and from there on in May. The Premier League is our ideal challenge, the FA cup, Capital One Cup are insignificant for a drought of 8 years. The Champions League a higher challenge that can only be won through a better squad depth. Baby steps…but quick ones at it. 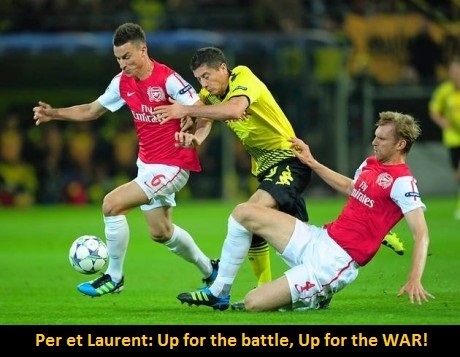 (1) DEF vs ATT: Liverpool and more importantly the SAS (Sturridge and Suarez) deadly duo: We have our own deadly duo- Centrebacks Per Mertesacker and Laurent Koscielny. In addition, our fullbacks are well experienced now to balance between defense and attack. Liverpool’s more central attacking play should help our cause of bombarding forward. Contain one of the SAS and we should have an unlikely cleansheet. (2) MID vs MID: With most teams, we have an upper hand when it comes to the middle of the park. 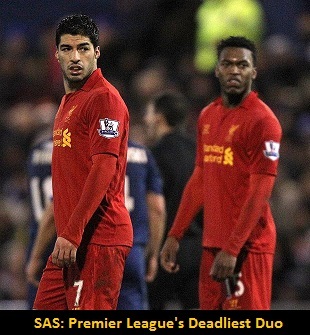 Henderson and the aging (yet world class) Gerrard have nothing on us. The game’s pace SHOULD be dictated through our midfield, so let us hope the Gunners diamond are up for it. (3) ATT vs DEF: I believe the main difference, the match wining point lies only on one man as has been the case for this season. That man is Olivier Giroud, not Ozil, Ramsey, Flamini, Cazorla but Giroud. He has to lead the line perfectly, hold up play and score at every chance he gets. His absence was felt in the midweek game against Chelsea. I sincerely hope Wenger gets us a good striker come January to partner with Giroud and offload Bendtner (I have nothing to say about this guy!). This is because some matches are clearly won with a 4-4-2 and not a 4-5-1. Giroud has to be our powerhouse today and score past Skrtel and Mignolet. Surprisingly the presence of Ozil has calmed me down this season. You may notice the ranting is less. But the improvement of the squad around him (Ramsey et Co.) is far more appeasing. I am a realist and a tad bit pessimist but I must say, this Arsenal can go all the way. Stick together, work for each other and play the Gunner way. And we will be unstoppable. Have a good weekend Red n White Army! Score Prediction: 2-1 or 2-2 . This will be a tight finish, so hold on to the edge of your seats Gunners. Well well well … 2-0 up somehow! 2-1, 2-2, 2-3 oh wait 3-3, miss a last minute penalty (which wasn’t a penalty). End result- 11 games and 16 points, Arsenal’s worst start to a season. Almost one third of the season is gone and we are down the dumps. We are already out of the title race and even the most positive of the optimists would have to concede that our season is over atleast in the league, for now. And I think it is ok if we the fans think that way but sadly the players are having that mind-set even before we did! There was a sense of dread around the Emirates with the anxiety, booing, tension just by this lack of intensity and enthusiasm by the lads. Fulham just started the match on the fifth gear like it was their own home ground and somehow we managed to put in two goals. But after that it was pretty much the Berbatov and Ruiz show. 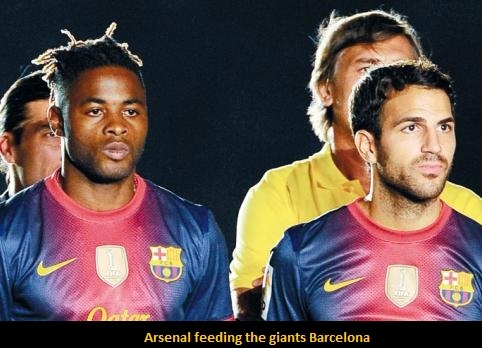 They had all the time in the world, there was no Alex Song to press them constantly. Meanwhile, they were pressing us to the extent that we had to keep passing back to the defenders who themselves were pressed to pass to Mannone. I was hoping we would redeem ourselves and have a convincing win but even after 2-0, I was still not cheered up and the notion around the room of Arsenal fans with me was still the same. We weren’t going to jump in joy until what the score line and performance was after 90 minutes. And well we weren’t disappointed but just sighing with the missed penalty and basically summing up our seasons for the past few years, so close yet so far. So talented yet so wasteful. I can’t put my finger on what is wrong with what is happening. But one thing is for sure, we lack passion and commitment and that can’t be covered with the excuse of having no or low confidence. Because just a few weeks ago- we were firing on all cylinders. I think the Scotsman at Old Trafford runs a regimen of discipline and demands 110% week in and week out. Our own boss, Mr. Arsene Wenger once upon a time would not even allow the likes of ketchup and chocolate in the stomachs of his squad members, but yet I am completely surprised at how we have the likes of Santos and other slightly unfit members in our squad. That would have been a complete no-no in his prime days of management. He used to have control and bring fear even among the toughest of men (Keown, Parlour, Vieira), he used to demand respect from those grown men. Somehow, he has turned from Master to a father figure having nurtured the likes of Cesc, Nasri, Theo.. Maybe he has softened his aggression and expects aesthetic and beautiful football to win. Even our Invincibles squad (2003-04) had to show grit to win some of their “vs Stoke or Bolton” matches. That is lacking in our squad. Some of you may think it may be asking too much of our squad, but 10 years ago, Arsenal made no excuses. Arsenal set the standard for English football. Arsenal defined the beautiful game that is football. Barcelona are just the new showmen in that sense. The current or somewhat newly joined Arsenal fans should not give in to lowered standards of success (if any) of our club. Arsenal FC was one of the best, if not the best club in the world. I’d like to think we still are. So do not expect less, do not be satisfied. We are the Arsenal. If Arsenal runs through your blood, those four words should send a chill down your spine and know that we were once proud, feared and respected. Victoria Concordia Crescit – DAMMIT that used to mean something now it is just transfer issues, wage problems and feeder club labels. We cannot pin our hopes of resurrection on one young already burdened shoulder of Jack Wilshere, although I am sure he will give it all to get us there. I like most others pray and wait to see Arsenal and its crest flying high in England, Europe … the World where it really belongs. This is your Gunner Az signing off, until next week’s North London Derby. Adios…. Hello. Some of you have asked as to why I had placed a very short Preview to Arsenal-United and why there was no post match analysis. Honestly after our emasculating display, I was considering just forgetting all about football let alone what has happened to our beloved club. But I’ve gathered myself because if you’ve been following a club for 12+ years, watching, playing and growing with the beautiful game and with one of its finest clubs, so it doesn’t go away that easily even if people running things are just taking from Arsenal and not giving back. I couldn’t get myself to sit and write this but now I have, it is a short rant and then hopefully after, we can resume to the Match Preview for Arsenal vs Fulham … God help the Gunner Nation. 1. 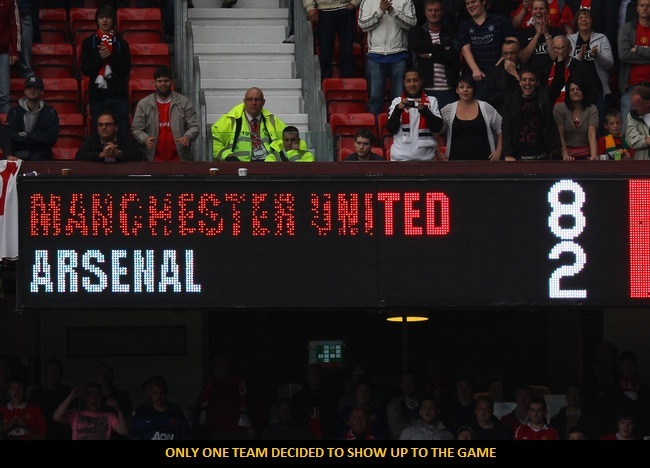 RIP Arsenal-United: Arsenal vs United has always been a heated event, with the whole world waiting to see what unfolds because it is this match that makes or breaks the season for either team. In that sense, it WAS much like, if not more significant than the El Classico. Gone are those days. Even Sir Alex said rightfully, this game has lost the spark that it used to have over the years. One sided game is a nice way of putting it, it was more like one side played the game. 2. 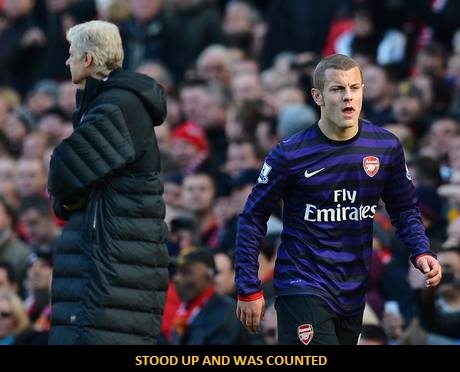 Player reactions: Poor Wilshere was the only one showing some grit and manfully got a red card. You could see the pain etched on his face seeing his club being torn to shreds. Even Van Persie and most of Old Trafford seemed to cringe at our dignity being thrown down the gutter. 3. Fan reactions: As fans, watching it was even more painful. The fellow Arsenal fans I was watching with could hardly see each other and just kept their heads down because we knew what kind of an evening it was going to be at the 2:38 mark when RvP scored with his first touch, inevitably. 4. Legends’ reactions: And somewhere, our legends- Patrick Vieira, Thierry Henry and Tony Adams must have been left fuming at how the badge in the front of the jersey had been let down. Even the boss had his head down. When your leader had given up hope then well, what else is there to say? Heck, even Roy Keane would have been disappointed. 5. Foresight: Something tells me that if things don’t go well against Fulham, Tottenham in the coming weeks, then we may be looking at big changes come the end of season. I would not be shocked to see Cazorla join PSG, Podolski elsewhere where he would play more centrally and Theo is sadly already one foot out the door. To make it worse, we will still have Bendtner, Chamakh, Squillaci and the rest still eating up our wage structure without having to put one minute of effort wearing the Arsenal jersey. Heck, if they are getting paid £60,000 a week for just chilling around, where do I sign up?? 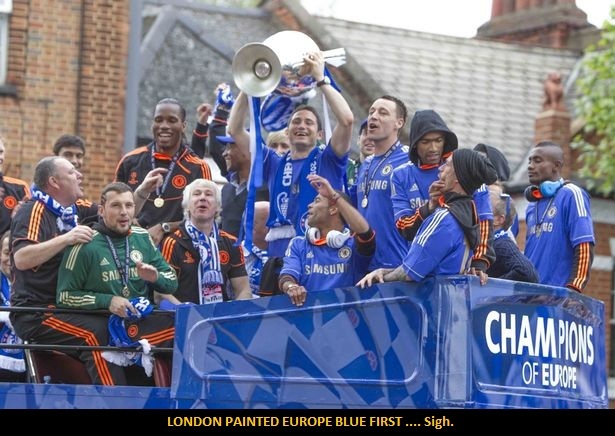 Exhibit A: It was tough to swallow that we would never be the first London club to lift the Champions League. With all our potential and achievements, we haven’t reached Europe’s footballing pinnacle and it doesn’t look like we will get there anytime soon. I am hoping like millions of other Gunners that in our lifetime we will see the Arsenal pick up that trophy. #Wilshere4Captain. Besides, that is not the only thing we NEED to achieve, our trophy room has been filled with dust enough to start a museum of history or no-history rather at the Emirates Stadium. And don’t say the Emirates cup is a title piece. 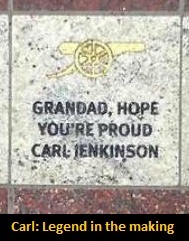 How I miss Highbury and the glory days! Exhibit B: Feeder club – Losing key players who moved on to greener money bills, I mean pastures- Ashley Cole, Samir Nasri, Adebayor, Robin Van Persie, Alex Hleb, Gael Clichy, William Gallas, Cesc Fabregas and even Thierry Henry. The last two, I can understandably agree that they give it their all for the Arsenal and we know they have Arsenal DNA in them. Exhibit C: More worryingly, we have sold very important players and not secured them- examples are Vieira (who wanted to stay, how we missed him in our midfield then), Song (who wanted to stay, how we miss him in our midfield now), Flamini, Nasri, maybe Walcott. You will have to explain to me how it makes sense that if you build someone like Alex Song up for 7 years till he is 24 and he has enough experience and came for training that day, yet he is pulled out of training to be flown off for a medical at Barca, he just had enough time to bid adieu to his now former team mates. 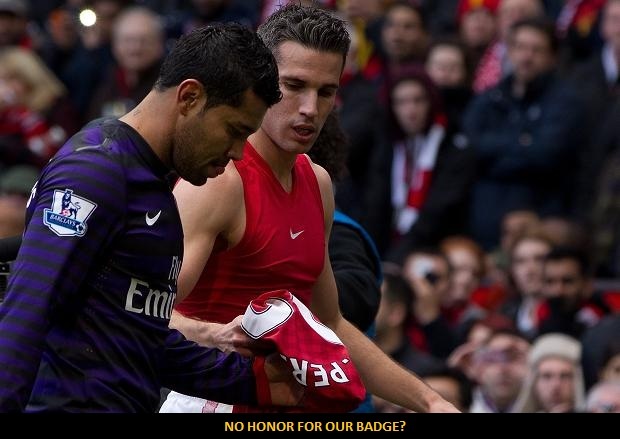 Exhibit D: I sincerely wish Andre Santos all the best for his future at some other club and wish to never see him wear an Arsenal Jersey, in my opinion it would be highly disrespectful to the rest of us who have year in year out, bought the Arsenal jersey amongst other things (posters, calendars, scarves….). Seriously, I think Nike knows my order in advance even before I ask. You save up all year and you also wait for Christmas or Birthday gifts hoping for it to be the new Arsenal Jersey and you have someone collecting an arch-rival’s jersey as a souvenir like we had gone to Old Trafford for tourist purposes?! Blasphemy! It is not a cultural difference, it is just COMMON SENSE! 7. Silver lining or just rainy days? : Having seen Arsenal struggle for the past 8 years, we may see a change in our upper management. It would be saddening but not shocking to hear our Boss Wenger say that he is going to retire having let us down, he truly loves our club but he is just not as supported as he used to be by David Dein. Stan Kroenke, Ivan Gazidis and Hill-Wood have done a smart business deal and I must say an economically viable plan by “self-sustaining” Arsenal and its finances. But the Glazers came in with heavy criticism at United, yet they spent £25-50million to get the likes of Tevez, Berbatov, RvP, etc etc and keep winning trophies and then rightfully earning some money by doing business… Even Liverpool have found money and gone about getting Torres for £40million, Suarez and the rest of them for good chunks of change. David Dein’s son has taken our stars rightfully (atleast for them) to where they would find more trophies and yes of course more money. Now this Wenger resignation could cause an uproar that would lead to the ousting of the current executive board and bring in the likes of Alisher Usmanov (who would give Roman Abrahamovich a run for his money) and David Dein, his now close associate at the Red and White Army. Trust me, next year’s AGM will be far from less hostile. Possible line-up: Mannone (Italian boss), Vermaelen (NOT SANTOS), Koscielny (No more own goals), Per (German Machine), Sagna (Sigh could leave soon too), Arteta (Ever our Stalwart), Cazorla (Thinking of Man City or PSG? ), Walcott (could be his last few games for the Arsenal), Ramsey (suddenly our midfield is out of options! ), Giroud (hard worker, keep your head up and sulk less Gunner) and Podolski (play him centrally or lose him next summer too!). Prediction: BETTER WIN THIS CONVINCINGLY! There are a few things I enjoy in life and one of those is Arsenal FC, let us hope the players and the manager and hopefully the board step up and bring glory back to its home. CMON ARSENAL! CMON ARSENAL! CMON ARSENAL! Nothing to say, this is it… Win and avenge the 8-2 or go back heads down. Wilshere be our saviour. Apologize for the delay, there was an error in uploading. So I’ve re-uploaded it now. This is the Arsenal vs QPR Preview at Home (But does that really matter now? Let us find out). Right, so how do I begin? Two straight losses in what was expected to be a very smooth October. The worst part being that we lost both games without a fight. There was no spark in the engine, no light at the end of the tunnel, no wheels in motion. 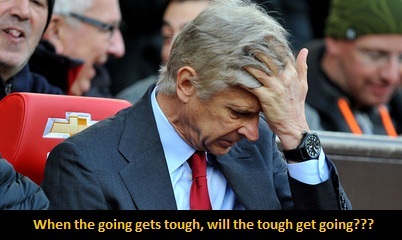 It was really surprising that the Boss actually let two games slip by without any performance from his players. I’d be shocked if it were a trilogy of defeats with no effort shown. I’ve been going on and on for the past few posts and the entire last month that we need some fuel to move us through the second phase of our season. Arshavin doesn’t seem like the solution (Yes I’ve finally given up). Chambo and Theo are out so that’s that. JACK WILSHERE HAS TO BE OUR SAVIOUR! As for now, let’s see how we can “cope” with QPR (Yes, it has come to this). DEF: Santos (Okkkkk), Vermaelen, Per and SAGNA!!! I believe Corp. Jenkinson will burnout; he needs some rest to prevent any long term injuries. MID: Arteta, Ramsey and Cazorla as mentioned in previous posts will remain our midfield trio. And in will come in our man, the little engine that will hopefully kick things off to a good win, the saviour for the future of Arsenal FC and the Three Lions- JACK WILSHERE. ATT: Podolski and Giroud. With Gervinho heading to the African Cup of Nations, it is important we get these two strikers to gel and have a better cohesion about them. So that when we finally create, we know we have two people who understand each other and can score well without ruining it for each other or anyone else from midfield. Giroud really needs to hit the ground running today. You can bet your top dollar or pound (or insert currency here) that Wilshere will ask questions of the QPR defence. Good: Jack Wilshere and Santi Cazorla playmaking together- should be a delight. Bad: The culmination of this weekend will confirm if we are out of the title race (for sure) if Chelsea beat United. Plus Roy Hodgson wants Jack playing for England as soon as possible (Need I remind you that Wilshere’s England participation resulted in his 17 month layoff). Ugly: The Arsenal AGM (Annual General Meeting) was pretty much well … ugly. Questions being asked about why we still can’t compete with the Manchester clubs and why the Pensioners have in a short time won a few league titles and become the first London club to lift the Champions League (It makes me tear up to this day) were all left unanswered. If that wasn’t enough, they (Ivan Gazidis and Peter Hill-Wood) had completely shut off any questions about Alisher Usmanov. I’m not even going to mention anything more about Kroenke (he has done a brilliant investment, so kudos to that businessman). Prediction: Not in the slightest mood to predict. Ladies and Gentlemen, this will probably be the just another rant in blogosphere history. But read it and have a think and do share if you felt the same too. For the first time in my 12+ years of Arsenal fanhood- I’d actually fallen asleep watching an Arsenal game, granted I was immensely tired after work and workout. But I’ve always watched till the final whistle but yesterday I found it real hard. Even our players were just completely jaded. Each player was still figuring out what he had to do on the pitch even Santi Cazorla. Everyone was of sorts, plus Chambo’s got injured. Sigh…. There really isn’t much to say, even the boss just came flat out and admitted and I quote: “We were well below par today”. Having said that, credit must go to Norwich who took full advantage of our state of jetlag and lack of coordination. Folks I think we can all agree and blame it all on one thing and I have just two words for that – International Break! But wait, how do teams like United, Chelsea, Man City get away with it? Is it our squad depth? Or the lack of quality in the deep ends of our squad? Let’s take a look. Man City were a goal down and they had Edin Dzeko come on and score the equalizer AND the winning goal. Chelsea just destroyed Tottenham at the White Hart Lane and I don’t need to tell you about their resources. How about United you ask? Well they bought this striker, remember? Last year’s top league goalscorer, used to play for us… Robin Van Persie, yea he scored two goals for them and assisted too. Yea they bought our best striker. But then you ask me- what about their substitutes? Danny Welbeck is their reserve who comes on to score one more along with Rooney to make it 4-2 against a resilient Stoke City. When we had our reserves (by which I mean substitutes) on, Arshavin was lacklustre although he has so much more potential and Chambo got injured. Chamakh is already set for Bordeaux by the looks of it. Theo was injured, Koscielny out with a back injury while playing for France. So yesterday should have been a routine win but noooooo it didn’t happen. We have Schalke this Wednesday but luckily its at the Emirates, so let’s hope the lads recuperate faster and make that three out of three in the Champions League. I will catch up with you folks for our weekend game at home to QPR. Until then I hope you all are praying like me when I say SAVE US WILSHERE! Rumours are circulating that the rightful heir to the throne of the Arsenal Kingdom has returned in service to his legion. He is touted to replace the memories of yesteryear by upholding the same qualities that were displayed by his predecessors King Henry and Prince Cesc. He has also been duly notified that the jester of the court – one Robin Van Persie has left. He was also been reported to have approved Arsenal’s acquisition of the services of two new commanders in chief – General Podolski et General Giroud. 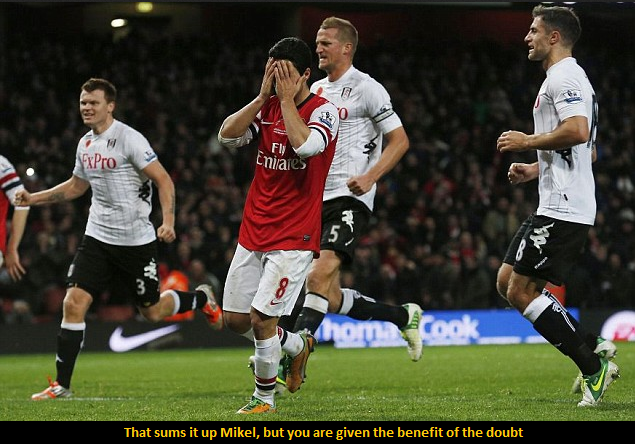 He would also get back to matters alongside his old allies from his youth- Knights Diaby, Ramsey and Arteta. But most importantly, what will happen in the English continent is his new alliance with the Excellence of Execution, a wizard even- Santi Cazorla. These are signs of prosperity in terms of the royalty displayed. The new councils at Stamford Bridge and theEastlands along with the perennial archrivals overat the Kop, Old Trafford and White Hart Lane have all been warned of his return. He is JACK WILSHERE. I know remove my Medieval style thinking hat and proceed to our Match Preview for Arsenal vs Norwich (Away). Well that was a looooooong international break but I am glad we are back albeit with Theo getting a nasty injury but this is aint the first time he’s got injured after finally getting back good form. Let us hope he comes back strong, well atleast he has so much time to sort out if he is going to stay or leave. DEF: Santos, Vermaelen, Mertesacker, Corp. Jenkinson. I’d like to see Santos get some game time and that is exactly what will happen with Gibbs out injured. Koscielny didn’t have a good outing for France, he has a back injury as well, stay strong Gunner. He will hopefully feature at some point in this month’s fixtures.Sagna is back too, but not to full match fitness, I am sure he will be eased into the matches. This month’s fixtures aren’t as demanding as they usually are. ATT: Giroud HAS to feature, he is just picking up pace for club and country both assists and goal wise. Him and Podolski up front should be a delight to watch. We can FINALLY have a two striker/forward pairing, last seen in the Arsenal circa 2003/04 ala Dennis Bergkamp and Thierry Henry. Arsenal 3-1 Norwich. I expect us to give away a sloppy goal or a penalty given our team rust. But we’ll switch gears once the players get back to how it was two weeks ago (wow it’s been two weeks?!) and we will win with all guns blazing. So … Buckle up, sit back and relax. It’s the weekend and this is ARSENAL !!! Look forward to our post match analysis and thank you for reading. Plus if you have any special article requests for all things Arsenal or even football in general please do let me know. With all honesty, it is a delight writing for you fellow Gunners and also for other fans who are kind enough to appreciate this, all you lot are the best in the world! Cheers! Ahahahaaaaaaa! 3-1 to the Arsenal, I was delighted with the victory and how well we handled a rugged West Ham team. For this Post Match Analysis, we will take a different view and analyse the game from start to the end (rather than the individual performances – only because today was a team performance and because this was a derby match). I would say we have gelled as a team to about 85%, there is still some more intuitiveness needed in our game. But I was happy to see faster and fluent passing, more accurate team play. I think the last 15% would just be to have better communication ESPECIALLY when it comes to who is going to shoot a dropping ball or who is going to pick up the ball after defending a corner. A few back and forth attacks by both teams told us that this match was going to be pacy and intense. Mohamed Diamé just kept us on our toes and he ended up scoring a brilliant goal. But I almost always prefer when we are 1-0 down because that brings more out of us soon after. As expected, it rightfully did with Giroud toe-poking the ball into the goal with a move which he initially started and linked to Podolski with. Just a few minutes earlier, Giroud had misplayed a headed ball forwarded by Per into the box, so that goal made up for that. 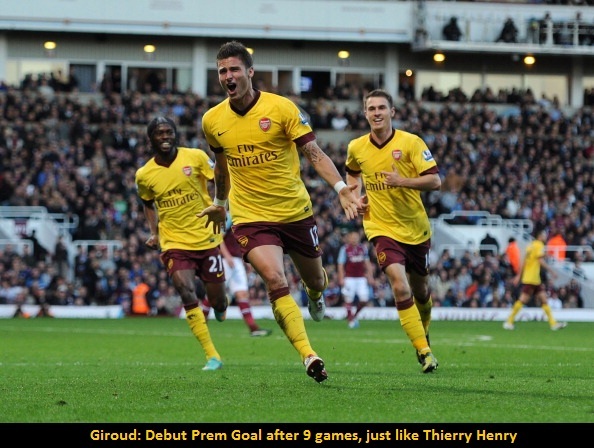 Now, Andy Carroll seemed to be immense for Sam’s team but this is where his counterpart – Olivier Giroud was even better. He had lesser chances to win the ball, but he made it count each time- that made the key difference in the score line. So it ended 1-1 at the first half. Oh and a VERY cool fact, if you remember a few posts ago, I told you that Thierry Henry took 9 league games to score his first goal, well Giroud has taken the same 9 games to score his first league goal- Only in football ladies and gentleman, only in football. The second half started with a more intense Arsenal, probably boosted by the equalizer and some strong but encouraging words from Le Boss Wenger. As time went by with the two teams still getting back to groove post half-time, they started to get tired and Diamé was taken off. Phew! For us, Gervinho who played well was taken off to be rested and Theo came on. Ramsey was not substituted because he was just being a brilliant central midfielder. His movements remind me of Tomas Rosicky, the way he turns, collects and moves about the pitch is so uncannily similar to the Lil Mozart. Theo scored a good goal (assisted by Giroud) and very passionately celebrated and I’ll be honest, I wasn’t a big fan of his but after his recent performances, he has every right to demand to play in the central striker position. Two things ended the match in a fitting manner; one was the Vaz Te-Mannone incident. Replays show that Ricardo Vaz Te had intentionally used his shin to kick into Mannone’s head and decided to dive after to make it look unintentional. What happened when he dived was his shoulder dislocated and he seemed to be in immense pain. Hopefully he gets well soon but that is karma getting right back at you. That is an important lesson for ANY footballer new or seasoned. FIFA’s fair play system may not be quite effective but the beautiful game was made so only because of playing good, clean and enjoyable football. I like tackles and such, but if you go about kicking people in the head for joy, you need to get your head checked first. 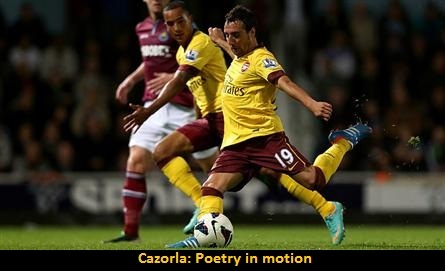 And the finally thing I wanted to cap this post off with was that beautiful goal by Cazorla. I have no words to describe this little masterclass. You have to go watch the goal again, simply amazing! So at the end of the match, we know we can wrap up games however tough they may get. We also know that Gibbs may be out for a while after he picked up a knock but Santos can deputize, that is what he was bought on for. Oh and I cannot leave without mentioning the performance of Corporal Jenkinson (from a family of Arsenal fans), he kept flying down the right wing and kept at it all 90+5 minutes. I am so happy for him and I am sure his granddad is too …. Well we have a 2 week break (sigh) but I’ll see you on the other side, when we face Norwich away on the 20th of October. Cheerio!